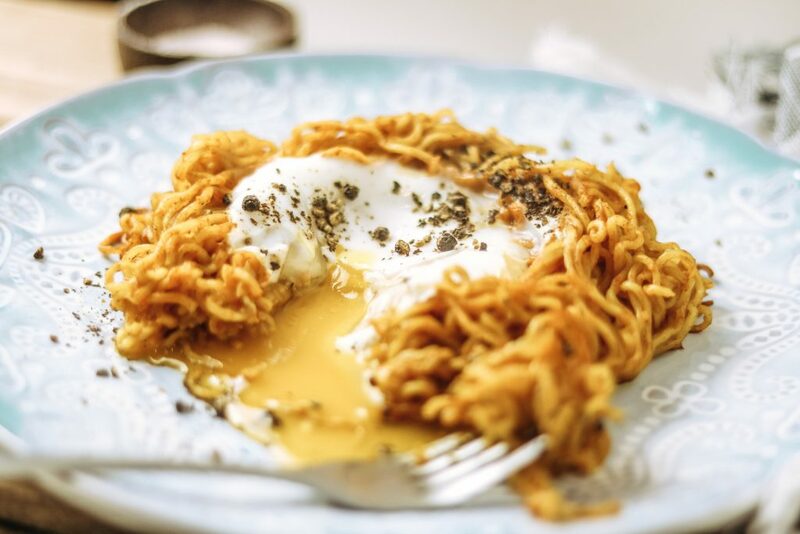 For tomorrow’s Thanksgiving brunch, I am sharing what should be a staple at every desi’s table — eggs in a Maggi nest. I love creating different variations with it because sometimes I eat it dry, and sometimes I make it into a legit ramen-like soup. And my obvious reaction was HECK YEA. I love getting Thai Basil Noodles with egg in them, or eating ramen with a hardboiled egg – basically, noodles and eggs make me happy. 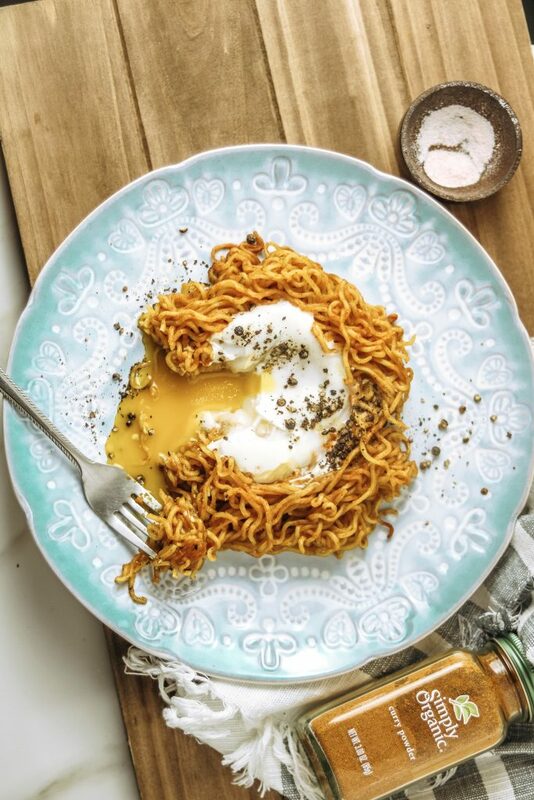 So, for these Maggi nests, I wanted to do a runny egg. Runny eggs are my FAVORITE, but let me tell you why this recipe goes so well with them. 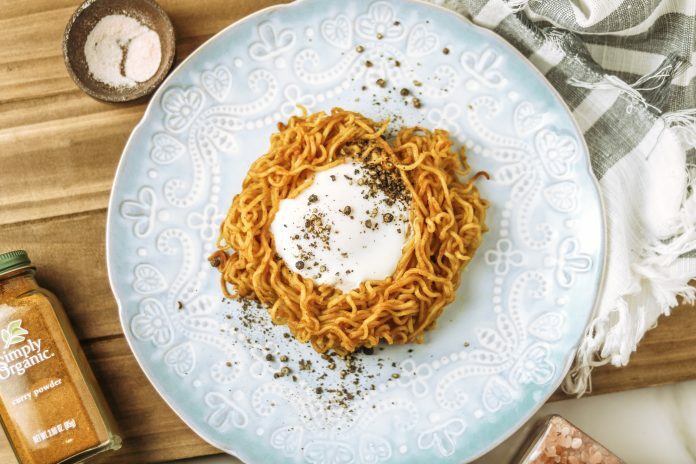 When you boil your Maggi to al-dente and then make a nest, you are, essentially, pan frying it. The noodles will get super crispy at the bottom and slightly dry out. The runny egg adds the perfect amount of moisture to your nest so it’s not dry, and it adds a boatload of flavor! You can also dip toast into the runny eggs for the proper brunch vibes. I’ve never been satisfied with JUST the flavor packet that we get from Maggi, so I always add in my own seasonings. A lot of times I’ll add in peppers, garlic, tomato and onion, but for the sake of this recipe and making nests to pan fry, I didn’t think it would work out so great. 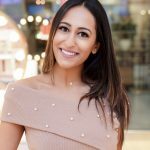 I also just wanted to keep it simple and easy because your Thanksgiving family brunch is supposed to be enjoyed by eating, not cooking and cleaning in the kitchen all day. I hope you guys have a great weekend. Enjoy eating, spending time with the family, and resting with a couple of days off! Boil the Maggi Noodles to al-dente, about 2 minutes or so. Drain out all of the water and then add in the flavor packet that it comes with. Also add in turmeric powder, cayenne pepper, curry powder, salt and black pepper per taste. Warm up oil on a pan. Keep heat on low-medium. 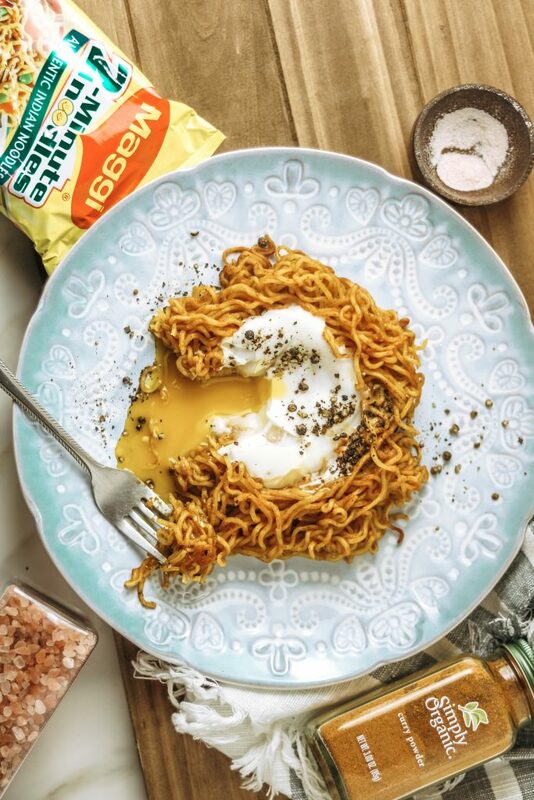 Form a “nest” out of the Maggi so that there is a perfect little hole for the egg. Put it on the pan and crack the egg directly in the hole. Cover your pan and let the egg cook on medium heat until it’s cooked through. It took me about 6 minutes for a runny egg. Take off of heat and serve immediately. Garnish with more black pepper and pink sea salt if you have it!